Samaria is a rising third-year MDiv student originally from Liberia, West Africa, who has lived in Atlanta for over ten years. She has served as an admissions ambassador and is an active member of the Broken Vessels worship team and the Candler African Theological Student Association (CATSA). 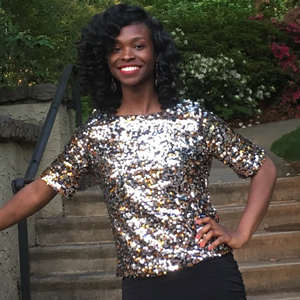 Today, Samaria reflects on watching her friends graduate from Candler this week, and what she will take with her into her final year of seminary. Graduation is without a doubt the most anticipated event of one’s academic life. It is no different here at Candler. Finally, after a year of being asked, “So, what do you plan to do after graduation?” the day arrives when this diverse group of men and women become Candler alumni. For me, this year’s graduation ceremony was bittersweet, to say the least. It was bitter because the graduates are people with whom I have spent the last two years laughing, reflecting, studying, and struggling. To go through a school year without them and their various contributions to Candler is a foreign concept that I am not yet ready to accept. However, it was mostly a sweet occasion because we were celebrating the culmination of years of hard work, deadlines, and far too many sleepless nights. Seeing those who I have sat next to in classes or had conversations with in the atrium accomplish one of their academic goals was exciting. This is a group that deserves to be celebrated not just because of their academic achievements, but also because of their commitment to being advocates of God’s justice outside of the classroom for lives that matter, but are often killed or neglected. It was a great pleasure to be able to cheer them on as they basked in the long awaited merriment of successfully completing programs that stretched them academically and spiritually. An even greater pleasure was seeing families, friends, and loved ones share in this joyous occasion that was a result of their support for these graduates over the years. It is often said that “it takes a village to raise a child.” Seminary, too, requires a village. As their loved ones ecstatically shouted for each person walking across the stage, it was clear that these graduates have had many people praying and providing support for them throughout this journey. Not only was this graduation a cause for celebration for the people whose names are now proudly displayed on diplomas; there was also cause for celebration from those who had invested into them so that this success would be possible. For so many, this was not an individual accomplishment, but an accomplishment for the entire village that has supported and molded their brilliant minds. As a rising third-year student, I am far too aware that my time for this experience will come. Soon, I will be the one to whom the dreaded question, “So, what do you plan to do after graduation?” will be directed. Soon enough, my name will be called and I will be walking across the stage as my village is present to celebrate our accomplishment, my degree. Bearing witness to my friends receiving their diplomas has increased my anticipation even more for my day, but more than anything, graduation showed that this sometimes seemingly impossible journey of seminary can and will end. Seminary itself is not everlasting, but the impact of what we learn here should be. The knowledge we have gained in and out of the classrooms should forever be imprinted on the minds of those who graduate. As we celebrate the fact that their journey here has ended, we also recognize that this graduation served as the beginning of an everlasting impact that each member of the Candler class of 2016 will have on our world. May the imprint that they have left on our Candler community inspire us to be better advocates of God’s justice.